Llais/Voice, A perfect example where music and performance complement each other completely. Elgan Rhys devised this piece based around Amanda Todd’s YouTube video, where she uses placards to tell her story of bullying and depression. Without the use of spoken word, Llais/Voice incorporates dance, multimedia and live music to express Elgan’s own past experiences. This performance was cleverly constructed and pulled on my heart strings. His passion captivated the audience and immersed us into how growing up is probably one of the hardest things to do. As I’m a lover of live music in shows, Llais/Voice was a perfect show for me. Josh Bowles accompanied Elgan with music that made the performance all the more beautifully striking. His talent for composing and his high level of musical ability made this show elevate its professionalism. The maturity and elegance Llais/Voice had makes it a wonder that they are just a young company. One thing I would have liked to see was the beginning to be just as insightful as the rest. It took time to get into the body of the work, yet it was well worth the wait. The progression kept going until I was spellbound. Llais/Voice is a must see if you want to see beauty from pain. This fun-filled 50’s themed extravaganza was just what I needed to top off my first night at the Edinburgh Festival. 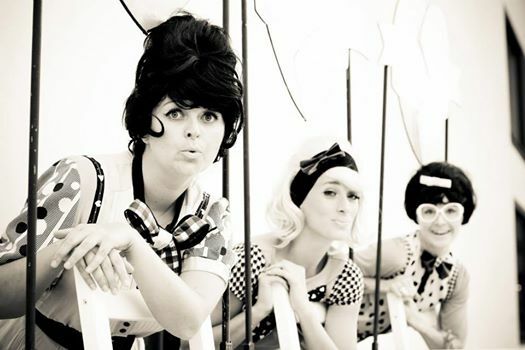 Three stunning girls, dressed up in typical 50’s clothes infused dancing with comedy, singing and love booths. The audience interaction, though highly entertaining I felt got a bit over the top at parts although it did leave most of the audience in stitches. The girls kept their charismatic roles throughout while being accompanied by carefully picked songs that went perfectly with the action on stage. One thing that would enhance this performance was a more in depth story line, a carefully structured plot that would capture the audience even more. However it was a lovely night of light hearted fun, an informal space where you could be as chilled as you want. If you’re looking for love or just a bit of classic fun then this show is a must see. 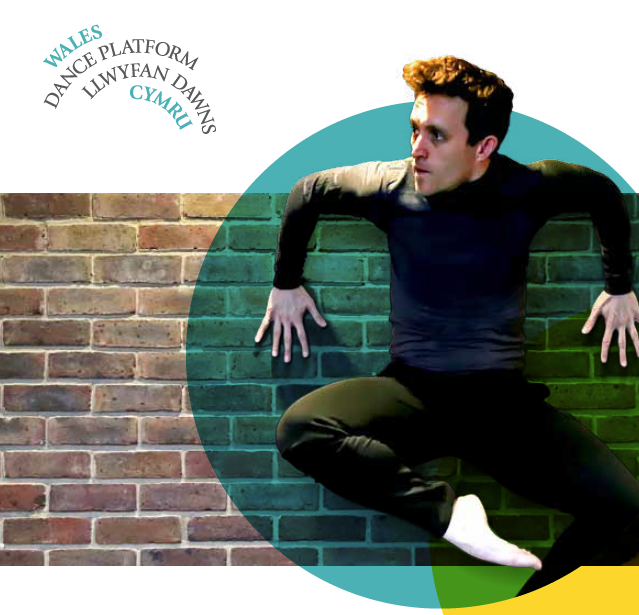 Wales Dance Platform –A Valuable Contribution to the Contemporary Dance Scene in Wales. A week-long programme of contemporary dance in venues across Cardiff which included the Glanfa stage at the Wales Millennium Centre drew audiences from all over the country and nationwide. Independent dance artists presented innovative ideas in choreography, film and photography. One of the major highlights of a talent-filled week took place on the final Sunday when four independent dance companies performed on stage at the Sherman Theatre. Among these was internationally known Ballet Nimba, from Guinea. Idrissa Camara and Oumar Almamy Camara gave a mesmerising and energised performance, leaping around the stage in what appeared to be manic but was in fact perfectly controlled yet acrobatic dance representing masculine identity and the age-old battle for dominance between father and son while reflecting the uncertainties of the social and political scene. Those old enough to recall the visit to the UK from South Africa in 1974 of the show Ipi Tombi, a pastiche of a variety of South African indigenous musical styles which caused some controversy among critics at that time, will have noted similarities. Ballet Nimba deserves an accolade for the way in which the traditional urban and village roots of the dance is retained alongside modern dance moves and stylistics. 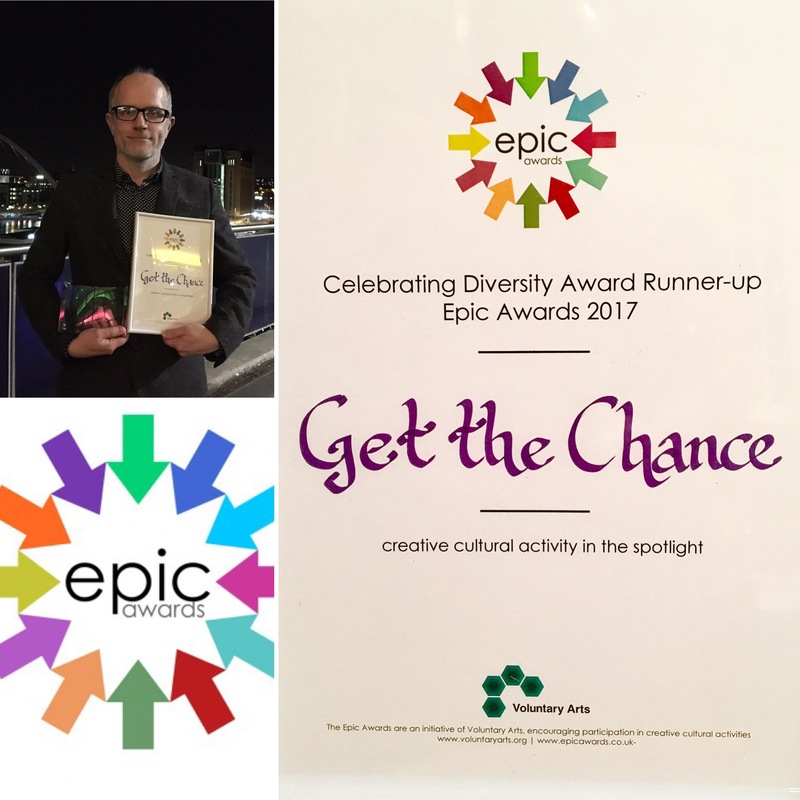 At the conclusion of the Platform a £1,000 award for “The most innovative and eye-catching work” an award was presented to Gwyn Emberton for his ‘The Devil in Eden’, a duet taken from his work My People, based on the book by Caradoc Evans. The Wales Millennium Centre was the main setting for the launch of the Wales Dance Platform 2014. 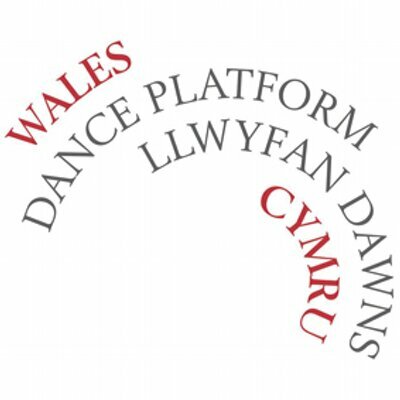 The Platform aimed to showcase those in the Welsh dance world, with a variety of ideas, approaches, techniques, medias and many more. Some featured work in solo, duets and ensembles and some featured were even in the media of film and photography. In the decreasing light of the Bay, we began with an invitation to watch a children’s based slapstick comedy by Lisa Spaull. The Glanfa, which is the open area of the WMC, provides opportunities for many performances day in and day out and was a lovely area to invite many of the public to see this free exhibition. The slapstick dance not only showcased the dance techniques of this duet but also evoked giggles from the children in the audience, beginning a lovely start to the weekend. The weekend in the WMC continued its showcase with two sessions of 10-15 minute performances in the Western Studio. They all ranged and were extremely different, although some professed the same skills from contemporary training. The studio was a multifunctioning space and so allowed the performers to utilise it to their needs. Each time this successfully gave the feeling of a new show. An example of this was a change of almost proscenium styled viewing from Cai Tomos, to a half circle opposite one another for Lucy May Constantini. The different medias used such as film, voice and music whether this be recorded or live, drawing in Merega Palser’s piece with salt and the use of glitter and lard in Gareth Chamber’s unordinary performance also gave a variety to the evening. Gareth Chambers, especially, ended the night on an unusual high with his performance showing an extreme of vulnerability through balance on lard and baring his skin to us. This main shocking performance, I felt, gave the night as a whole a lot of food for thought. Each piece professed its own views on areas of life and ensured that we as the audience were well prepared for the weekend ahead with diving straight into the deep end of modern-day dance. Finally, to note, as mentioned before, the use of different medias made this beginning something to remember. We forget that the beauty of dance isn’t just in the performance but that it can be documented in many other ways. James Williams, who also treated us to dance in Chapter on the Saturday gave a photography exhibition of dancers in Nest Project. The photographs were stunning, showing the anatomy and muscle definition of fully fledged dancers. The impressive highlight caused not only jealousy of the ordinary person but inspired and gave a sense of awe at how hard these professionals work, exhibited in their bodies. The most powerful photographs were with the intense stares of certain dancers in the moment. They professed concentration in their work but a sense of voyeurism, as if we had interrupted into the rehearsal and movement of these dancers. Day 1 had easily prepared us for the weekend and excitement for what we had yet to see. After the exciting and varied pool that we were involved in on the first day, the excitement of day two of the Wales Dance Platform in Chapter Arts Centre was almost something to not contain. This unordinary centre, with its bohemian feel, seemed like a perfect place for work that was experimental and full of impressions to be made. Such as the first night, this weekend was not going to be just about dance performances. Creative producer of the Wales Dance Platform, Roy Cambell-Moore exhibited his beautiful photographs of dancers in India which showcased on screens in the foyer. These were colourful and vibrant and such as the photographs from the previous night, exhibited the core of dance and dancers. Following this different medium, a showcase of films which ranged from documentarian pieces from African dance which was full of energy and a different feel to the dance we are used to in our own country, to rehearsal pieces from Aleksandra Jones and her work with pregnant women which also gave a new view to dance with people we at times think are vulnerable with movement in their different state. Even this small series of film showed us that dance is so diverse and can be so beautiful and admirable in many different ways. Chapter’s versatility as a venue was helpful to the weekend. This not only helped the rehearsal of performers but also with the change for the performances. We entered the loft space for a small and informal talk for performers about touring, self promotion, relationships with producers and much more which was extremely informative and helpful, especially as a freelance performance myself. The Stwdio then showcased a beautiful piece which illustrated the strong bodies of dancers and their ability of restraint with small movements over a long amount of time. This was inspiring and somehow captivating to watch despite the little amount of movement. It showed that even silence and stillness is just as powerful as consistent movement. The bar area was used for Jukebox collective’s work with hip hop and modern chart music. This, I felt added something special to the weekend. It was a definite change-up from the weekend and punctured some fun, light-hearted entertainment. Again, we were welcomed to a thought-provoking and impressionable piece by Gareth Clark (Mr and Mrs Clark) with Smash It Up. This thought-provoking and culturally poignant piece showcased the brilliance that are the Clarks, and how they are little afraid to challenge the status quo. Comical moments were also implemented, as is their style with spoken word in contrast to the movement, pin pointing facts in quotation form that all performers and even other audience members can relate to. A lovely addition to this weekend, however a small piece in comparison to the eclectic entertainment on offer was the taster to reflexology. As a dancer previously, the reflexologist had trained after retiring and so this seemed a lovely way for dancer’s to relax, especially with being notorious for problems with their feet. This nice addition added to the feeling of a luxurious weekend after the privilege of the entertainment on offer . The finale of the Wales Dance Platform ended in the lovely setting of the Sherman. Well known for its inviting family atmosphere as well as it’s occasional adult openness, it seemed relevant that there was a high involvement of family dance. Before this, we began the day in a series of discussions. The Artists and organisers critically evaluated the weekend from their perspectives, while myself and other critics and professionals discussed the Welsh critical state. This eye-opening and educational talk made an extreme impact on me, realising the difficulties that the arts world, while continuing striving in Wales, is struggling for journalism about such creative activities. It was lovely to meet such like-minded people and to hear their points of view and eagerness in the arts field. Following from this, we entered into a promenade performance from the outside with a fun pirate and fun and excited girl who wanted to be a pirate, to the foyer where the rest of her toys lived. This dance was fun-filled and a lovely beginning to the day. We then continued into Theatre two with a lovely and audience relatable piece about a daughter and her father and the heart warming performance about their relationships. This provoked moments of memory with comedy, friendship and the father/daughter duo easily showed their close relationship through dance. The obvious nature of this also came from the evidence of dance education through the generations. This section of family fun showcased not only a difference in the dance world and its versatility to audiences, but attracted families to the venue, which seems an increasing importance to do in the creative world. The second, and last series of showcases was more adult inclined but still was a possibility for families to attend as well, although not specifically catered for. Again, we saw a range of dance areas and the link with Chapter from the day before with the African dance. The energy was electric and consistent. I felt in complete awe about where they could possibly get the energy from. The change to live music and for it to not be of the conventional western style was a lovely change to many of the other pieces we saw. Perhaps more additions like this as well perhaps community based projects could have opened this weekend up and involved even more versatility. Despite the difference of work, many professed similar previous trainings and could at times feel very similar. Overall the weekend was a fantastic success. A wonderful way to see the eclectic variety of dance in Wales as well as an interesting and informative weekend with networking and other additions. 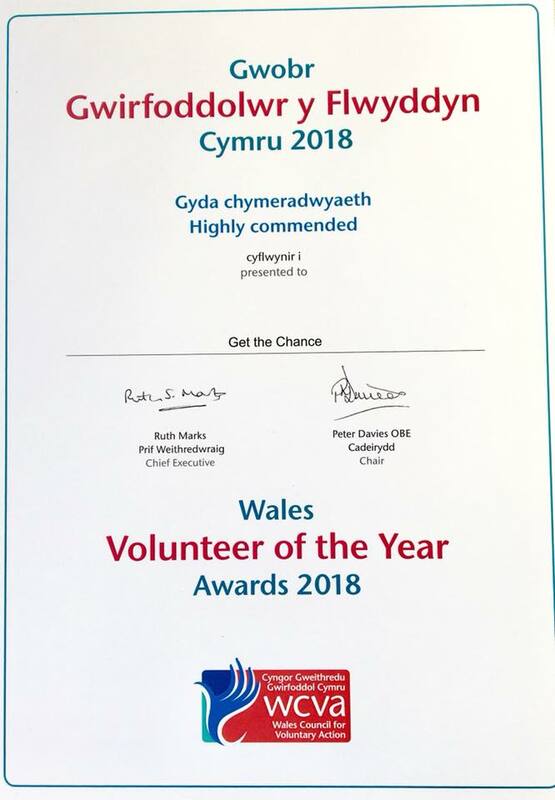 I feel very privileged that I was welcomed as part of this and thank all those involved. Dance in Wales is prominent and certainly needs more recognition through wonderful ventures such as Wales Dance Platform. When I come to Chapter and get to see a performance in the Stiwdio, I am always excited by the versatility of this space and how interchangeable it is. Complimenting this space, Dance Roads Open Process showed us five different performances, all changing the Stiwdio. Dance Roads is currently celebrating its 25th Birthday of a project supporting the development of performers from a range of countries. We get to see these shows, possibly ranging from raw experiments to almost perfected pieces, some performed by the Choreographers themselves, others directorial, and some a mixture of the two. The first sight we see entering the space is what was reminiscent to me as the circuits one learns in school when learning about electricity. This circular area seemed bare and slightly concealed by very dark lighting, with only two technicians in the corner of the stage surrounded by wires and computers. The use of a very dim and almost harsh light revealed a wrapped body in the corner who begins to move. This grotesque movement with the use of a ruffled fabric was contorted into strange shapes, leaving an uneasy yet intrigued feeling. Eventually with the contortion ending, we welcome Canadian performer Sarah Bronsard who provides a really interesting piece with a relationship between her and the circuit, soon revealed to make noises such as a metronome. With mostly use of her arms and majority her legs and feet, she began to make beats with her tap shoes that seemed to command the circuit, making several levels of rhythm, such as a percussion band would. Her intensity in the relationship with these small mechanical beings was enticing and the combination of her erratic and quick movements and her eye contact with them made you unable to keep your eyes off the movement for a moment. The quickened pace lead you to believe that we would have a crescendo of chaos, however, this ended in a moment of serenity with more graceful and peaceful movements, the beating eradicated and the focus on a shining box in the corner. This was very effective after several minutes of such mesmerising movement. Sarah was followed by a Italian Duet, choreographed and also performed by Andrea Gallo Rosso. The stage was cleared for a very minimalist piece, where our focus was purely on the two bodies in similar clothing. The relationship between these two men reminded me of a personal struggle –beginning by pushing one another, with graceful recoveries for a fight for the main centre place. It also seemed that, along with this, the difference in age (while not by much) of the performers could be seen as a younger and older self, also translated into the solo movements with the ‘younger’ self’s movements more erratic, risky and fast paced, as the others was slower, more graceful and careful. This contrast was very beautiful to watch; the dancers using a really good use of levels to draw the audience’s eye across the stage. The trust and clearly well practiced piece was very interesting to watch, especially with the performers never making eye contact with each other and very rarely use. The moments of collaboration needed both these elements and a sense of peripheral vision in order to catch each other and move as one. When eye contact was made with us, it was intense and very personal, bringing us into, what at times, was a very voyeuristic piece. Another circular stage was set up with a set of torches. We welcomed Pauline Buenerd to the stage to show us a piece by French choreographer, Teilo Troncy. Out of the performances so far, this was the most unordinary. Buenerd moved her body in slow and unordinary images in one space to the sound of silence. For myself, this felt awkward. The pace created a sense of this show taking a long time to come to any fruition. Eventually the pace was quickened, music was involved and we soon realise that the abstract images of snapping her fingers and moving her head was to a jazz band song that was in her head only. The joy transferred onto her face at the knowledge that we could now also hear this, and this joy then became evident in her movement across the stage. With many repetitions of gestures, throwing herself on the floor and jumping in the air, it seemed that this joy was the fuel for her. This again, was uneasy to watch and I felt myself hoping that the piece would end soon. And so it did at the moment that she exhausted herself. If this was the point of the piece, then it was well constructed, however a lot felt as if it was improvised on the spot with no real narration of the purpose. After a short intermission and change of set, we walk back in the Stiwdio which is once again transformed. Welsh choreographer Jo Fong had created a audience viewing the audience set up – with a camera image projected onto the back wall of the stage of us walking in and taking our seats, the audience participation was imminent with individuals waving at themselves and seeing the image facing them. The stage then consisted of 6 chairs with the two performers facing us. This began with an awkwardness from the performers, such as an audience would be, in a question and answer session after a show. Fong made a very clever piece using this idea; the status quo of the performers changing to then answering their own question of how they begin preparing for the piece through movement, trial and errors and critical evaluation of their selves. Their movements were meant to reminisce an uncertainty of performers, a nervousness and the mistakes made in solo and in duet rehearsals. These created very comical moments, allowing the audience to laugh and really hit home with us performers in the audience who have all felt this in preparation for a performance. Despite these awkward and nervous movements, the dancers were very engaging and still managed to show us elements that were well constructed despite the appearance of these feelings. Eventually, these all culminated in putting all these sequences together, with an element of the uncertainty still evident. Over all this well constructed comical piece, for me, was the highlight of the night. Finally, our final piece was another male duet by Jasper Van Luijk, from the Netherlands. The stage was minimalist, but more expectant of what we would see from a contemporary dance piece – white floor and walls with a haze of colour to give substance. There was something similar to Rosso’s piece before- two male figures and their fight against one another with moments of collaboration. However, Luijk had made this more violent and for some jumpy audience members, hard to watch. We saw as beautiful contemporary movements soon lead to chaos and throwing the self of one dancers with large hits to the floor, eventually this stopping him in a still pile at the centre of the stage. The use of moveable lights were given to the other performer to highlight this crumpled image, leading to him providing graceful movements around the body . I felt that I lost concentration at times during this and perhaps leaving such a standard contemporary piece till the end was a wrong move after such an energetic and audience involving piece beforehand. Broken – When we think of the word broken, we can relate it to many different visions. Broken objects, breaks in aspect of nature, heart break, broken parts of our individual World, things that break these elements and breakages from our own impact. Motionhouse’s Broken addresses these aspects including many many more. We begin with a pre-human World and almost the beginning of what we know. We travel through time to Earthly breakages as the surface of the World evolves; the impact of humanity discovering beneath the surface through mining excavations and the dangers of this and the heart break that comes with losing someone. This loss turns into hope, in the growth of trees and plants on the surface, penetrating the beneath and then the above atmosphere, with humanity’s discovery. We see cave man life, our struggle with (as the programme says) ‘our own shadows’, conscience and fears, soon landing us to a present day scenario, nature’s response to our modern ways of life and how easily these are broken. Confronted with a very simple set consisting of two poles and a large screen, already showing an animation of lights and accompanied by a mixture of technological sounds, it seems that we are going to see a production purely based on the dancers’ moves. Oh how we are wrong. This large screen soon continues its animation to accompany the stage performance, showing animations of earthly images, setting scenes for the performance such as a typical house set up for the final scene and throwing us into the deep end at first with an energetic eclectic mix of nature and almost Sci Fi images and sound. The screen doubles up as a way for performers to come on to and away from the stage; implementing staging through the fabric folds for the performers to swing and propel themselves from, including ledges later on in the house scene that can be manoeuvred to different angles, leaving performers hanging from the edges. The inventive fabric screen become malleable yet extremely strong, allowing the performers to pull against and lean through. Simple, yet incredible, the screen becomes a number of different set pieces in one. The poles also bend at the swings of the performers, yet strong enough to carry all 6 of them at once. All of this accompanied by a mixture of cracking and breaking sounds to compliment the images moving on the screen and music, the performers easily adapt their movement without the need for a beat. Smaller additions such as a mattress and one of the ledges are taken away from the screen to project images onto which brought the focus forward, showing a more interesting range of levels. The performers costumes stay simple yet effective for the timeline. With the use of mostly earthly colours, they bring a modern take on the naturalistic scenes they portray and such like the mattress and ledge, images are easily projected onto the fabric, encouraging the movement and animation to blend. This simplicity makes other aspects stand out, such as the beginning translucent and strong yet flexible ball that a lit up dressed female dancer is inside, contorting themselves and the ball into shapes which seem embryonic. This ‘leitmotif’ for stage recurs throughout as a symbol of hope – a guardian angel for those lost. This beautiful image not only comes from the costume, but the performers angelic and graceful movement. 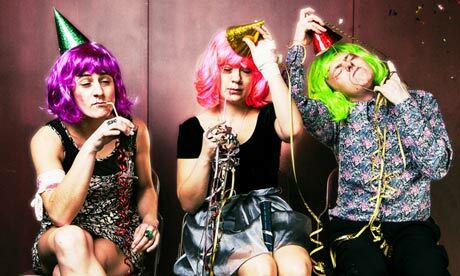 With three female and three male performers, it’s difficult to differentiate ability. We are used to seeing dancers especially in areas such as ballet, with a clear male and female role. However, evident by the muscular physiques of these performers, all are capable of each other’s roles, supporting one another physically and emotionally and with obvious indicative feelings of trust to one another with falling, swinging and throwing one another around the stage and set. Motionhouse do this very well, with the ‘guardian angel’ characters mentioned before played by the female performers; their flexible and small frames at this point change the status quo of the company, showing the elegance and maternal figures that these characters are portraying. This works extremely well when the ‘miner’ characters try to escape, one too weak to free themselves, and the pain this angel feels with her struggle to help him to freedom. Admittedly, the use of movement, music, darker lighting and the emotion on these two dancers faces are heartbreaking and brought a tear to my eye. Such a true to life piece cannot always have happy endings. 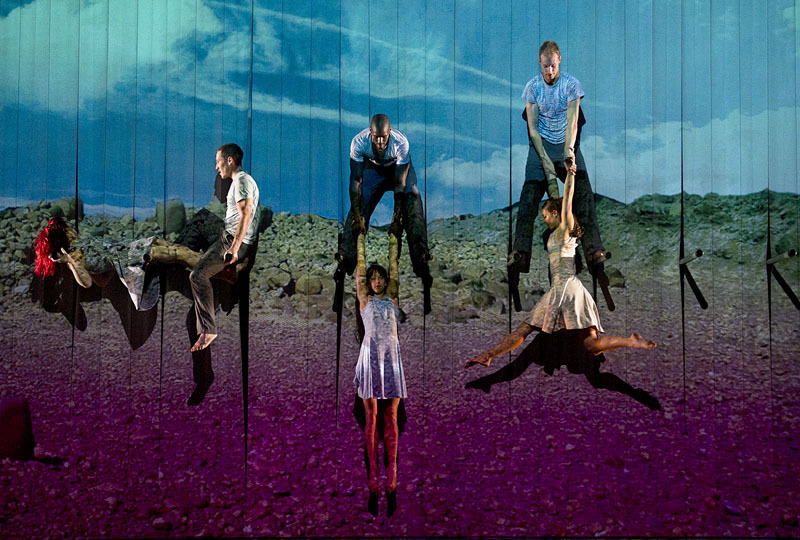 The performers showed their obvious hard work and dedication to the piece through their practice – the aforementioned screen showed animations that at times the performers had to know by heart to play with through the folds, such as cracks that moved with their own hands coming out and changes of horizontal poles in order for movement to cross the screen in mid air. All these elements produced an awe inspiring piece where, looking around, not a single audience member was not encapsulated by. Moments such as the heart breaking moment of the miner not achieving his freedom produced sniffles of tears from others (not just myself) in the audience, audible in between the breaks of sound; the moment where a ledge is thrown down, almost crushing a performer as he swiftly slides out the way evoked a gasp of fear and all of this resulting in a standing ovation at the end. A piece that leaves you not only looking at reality from a different perspective, but inspiring dancers and performers a like to create such thought provoking theatre. Upon entering the performance space at Chapter the proscenium framing the stage immediately said to the audience fun, disco music and 3 names in huge lights gave the feeling that we are indeed in the ‘party’ aspect of the Gym Party. Settling into our seats, the performers entrance with a quirky dance instantly gave the sense of comedy and that we were about to see something fun and exciting. Three performers with no specific gender at first, looked a little like disco Tim Henman’s dressed in white tennis gear and bright, colourful and similar wigs these complimented the stage with their simplicity, which was very effective – we were then able to focus on the actions and words. The contrast of individualism and community was a running theme – the three performers loved one another and were close as a group; they share, converse and communicate as a group but as individuals, they are each better than each other, and the Gym Party competition was how they showed this. The back and forward notion that they spoke in, from community to how good they were as individuals imitated what we think in society – that we want to work as teams, and think that we enter into this in a fair and innocent way but in any situation, we do this to try to show how good we are, to show that we are different to others, that we are an individual. Gym Party’s aim is to highlight this through comedy and games. Gym Party consists of 3 scenes in repetition – the interludes I spoke of above, the games and the consolations for the losers. 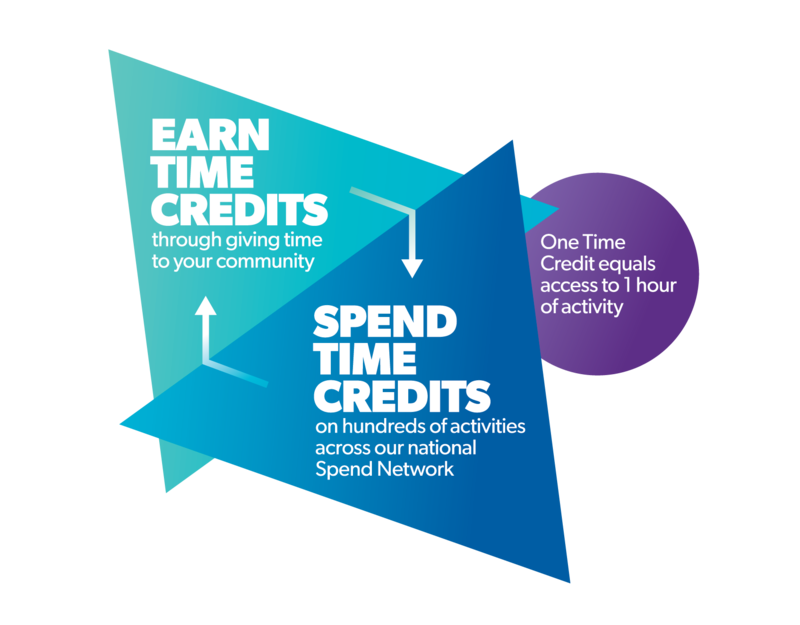 With three games, these sequences are repeated approximately three times (for three rounds of games) yet, this is never boring – each time we are given something new, a new game, a new story or new consolation prize. This is always energetic and keeps the audience interested and on their toes. The games themselves are ridiculous and hilarious. 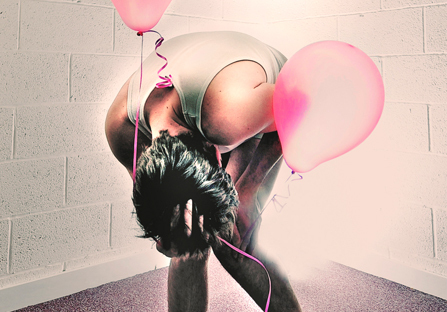 Firstly we see games such as audience throwing skittles at the performers to catch, head stands and marshmallow eating – contrasts of pain, disgust and comedy all in one set to evoke different emotions from the audience. The more the show goes on, the more we see the vulnerability that they are trying to convey about themselves and us; the second and third games utilising this by showing the vulnerability of us as humans and making the audience chose winners by voting on ‘who do you think’ questions, asked by an ominous being through sound and evidently, to the performers obvious surprise, random ideals such as ‘who do you think is the best kisser.’ This impromptu execution of the questions was interesting to see how the performers recovered with reaction and action on the spot, however there were times where they seemed to lose this professionalism and broke the performance barrier, showing their true selves. While at times this was funny to see their humanity, it slightly broke the illusion of performance. The audience choice in the third game of who gets to have the ‘last dance’ as it were also showed this idea of choice, vulnerability and need to be liked. We were soon brought back to comedy and happiness with the ‘contestants’ elaborate and unprofessional dance routines to cheesy disco music. The use of this, the lights, the use of microphone to thank the audience after a win, Chris’s musical interlude with playing a song ‘Evelong’ by Foo Fighters to highlight a memory, and highlight an audience’s memory gave the feel of a game show, and so the positive and negative contrasts made this game show a cruel conveyance of reality. Entering the Dance House of the National Dance Company Wales, the audience already was a mix of a variety of demographics and all obviously full of excitement and interest for the show to unfold. For a postgraduate show, the turn out itself was very impressive. The audience was left to become accustomed in the dark until a golden haze crept across the stage, cast by the lighting to compliment the figures elegantly entering from the wings. The dancers were kitted out in skin tight golden one pieces, with enlarged bottoms. Straight away, this gave a comical effect to the beginning piece as well as a sense of confusion to the costume choices. ‘Re-wind’ took images from artist Yeruba Yelsdraeb, who drew grotesque images of figures with strange placements of their hands, large bottoms and grotesque faces. The idea behind the golden costumes in contrast to Yelsdraeb’s original Victorian style outfits was to show the contortions of the dancers bodies to compliment the grotesque characters as well as to de-gender-lise them – however, a skin tight suit obviously makes this a little difficult to achieve. I found myself in two minds about this piece; there was an element of melodrama with the facial expressions of the dancers and also an element of ‘A Midsummer Night’s Dream’ with what I interpreted from the narrative. Personally, I feel that, in dance, expressions are translated into the movements and without prior knowledge to the stimulus, it seemed out of place. However, the dancers strong movements were interesting but at the same time, left me wondering where the more ‘contemporary’ part of the dance element was. A contrast to the first piece, ‘Mute’ began with very earthly music, costumes and scene. The programme describes this piece as ‘an intricate and haunting landscape in which narrative is torn between logic and lost meaning’ and this was very evident by the initial impressions. Mute showed more of a contemporary aspect to dance, with the usual fluidity that you would expect. However, there were contrasts between this fluidity and sharp movements, both from the dancers as an ensemble and as individuals standing out from the crowd. Dancers Marie-Corrin Chilon and Leanne Horsey, for me, stood out the most in this piece. Marie’s concentration and how she easily threw her elegant frame across the ‘haunting landscape’ was eye catching. Mute ended its stylish and energetic movements with Leanne’s jagged and intriguing movements of which seemed to become faster and faster till she was only a impacting blur. After a short intermission, a new and completely different production unfolded. ‘You, Me, the Door and the Floor’ began as a comical and interesting work of performance art. An almost game show about love and relationships, the main character went through an experience of a dance blind date, picking planted dancers from the audience and experiencing what a relationship with each character would be like, to find the ‘one.’ A delightful and funny game show host in the form of dancer Sandro Piccirilli (who steals one of the potential loves) executed the comedy effect well and was consistently in character, as were all the dancers. Metaphorical images and use of voice and microphone technology gave this a different feel from a dance piece and was a very interesting concept. A image of a turbulent relationship with animalistic noises and dance-fight images illustrated to the audience something that we all could relate to. The energy that was put into images such as ‘jumping through hoops’ and unadulterated lust and love were consistently high and impressive to how these dancers managed to keep this at top peak while using acting and speech. Finally, the piece that I felt we had slowly been leading up to, ‘Ocean.’ A reminiscence of ‘Mute’ with its early colours and warmth of the set and costumes was then slightly contrasted by the use of folk music, giving a more modern day twist to a potential mirroring piece. Ocean was astounding. Again, the level of energy seen through all the pieces was at its top and in fact, was above this with the constant fast paced movement. A use of deep and naturalist voices were used, resonating around the room and almost impacted you as an audience member deep down into your chest and stomach each time. Contrasts of the traditional contemporary movement to the naturalistic beating of the dancers feet with an external rhythm to the music was an impressive sight to see. The elements of dance, vocals, rhythm and acting skills show that these graduates are something special. Over all, the climax of the piece with this beat and vocals left you in complete awe and was the crescendo that one would want but not necessarily expect at the end of a contemporary dance piece. Ballet Cymru has justifiably earned the reputation of going, artistically speaking, where no man – or woman – has previously dared to tread. 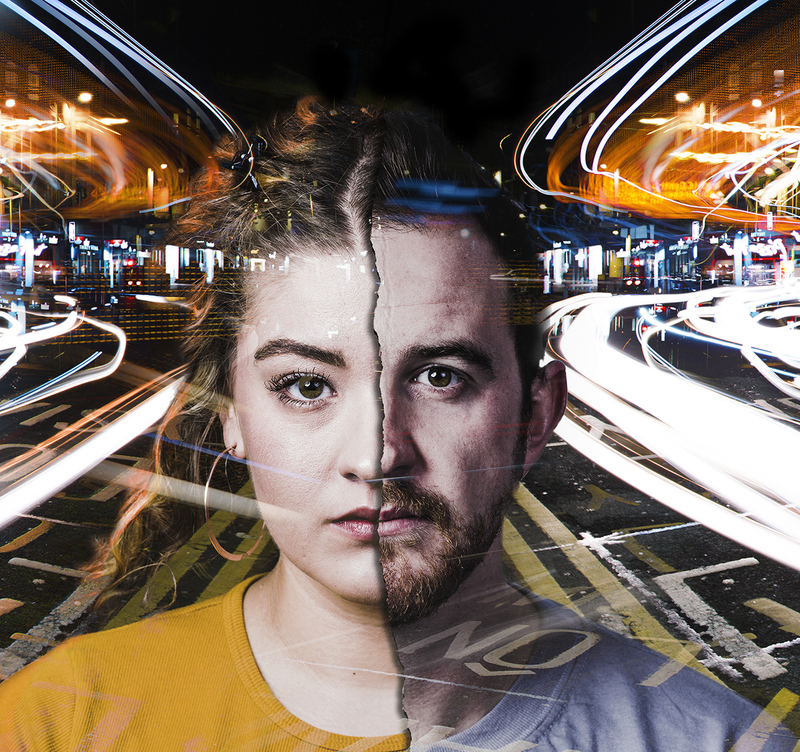 This double bill proves the point with a combination of contemporary dance and, in the first half, a score by award-winning Welsh composer Thomas Hewitt Jones which incorporates a major choral input, and in the second half the music of folk song. The dancers of Ballet Cymru showcase their expertise in this piece, based on a 35-minute choral work portraying Olympic values, with lyrics by Matt Harvey sung by the equally skilled Vivum Singers. The combination, in itself unusual, becomes even more so when guest artist Suzie Birchwood makes her entrance. Birchwood, who won a full scholarship to train at the London Studio Centre when she was 16, but had her training cut short a year later by the onset of generalized dystonia which has left her requiring wheelchair assistance, would emphatically not want this aspect of her life dwelt upon in relation to her dancing. So I shall only say that the determination required to appear on stage as a dancer in a choreographed piece that includes lifts and pointe work is mind-boggling. If that in itself is not deserving of an accolade, then the high standard of Birchwood’s work is even more so. Darius James is a name well-known to those familiar with the work of Ballet Cymru, and here as is the norm with him he makes huge demands of his team of dancers who rise to the challenge with an evident enthusiasm. This is contemporary dance but James is not afraid to acknowledge, and at times make use of, traditional ballet steps and format, and does so with a seamless expertise which adds much to the success of the performance. The choral input by the Vivum Singers is considerable and of a high standard, but there is a caveat here, in that at times attention is inevitably split between the dancers on stage and the singing. Choreography: Darius James, Amy Doughy and dancers of the company. A complete change of style, mood and scene for this work by Aberystwyth songwriter, singer and harpist Georgia Ruth, whose debut album is danced to here. Accompanying herself on the harp, and singing in both Welsh and English, backed by guitar, reed organ, bass and drums, Ruth’s is a talent which cannot be denied. Judging by the audience reaction, and conversations in the bar afterwards, many of the audience came specifically for this and, with each of six tracks telling a different story, there was undoubtedly an extra dimension to be gained for those familiar with the album.. However, for those more intent on the structure and performance as applied to the dance interpretation, some explanatory programme notes would have been helpful. Choreographing such a piece is far from easy, and while the dancers did their best to follow the mood swings of the score it did at times take its toll. Overall, an exciting and innovative double bill danced by a company of nine dancers all of whom display considerable talent. It remains to be seen whether or not Ballet Cymru’s declared objective of bringing in those who are wary of traditional ballet succeeds. Judging by the enthusiastic reception, it may well have done so. 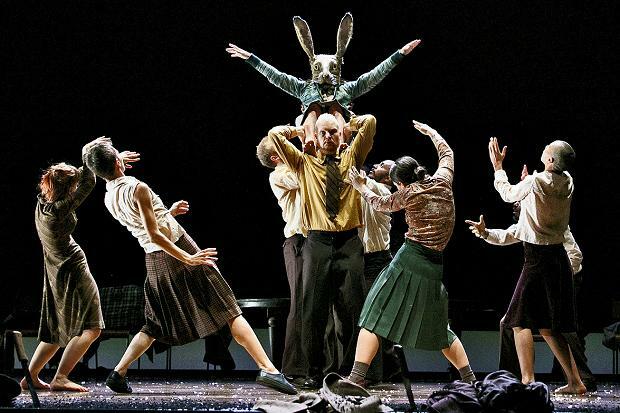 With a stark monochrome setting and virtually no scenery, Fabulous Beast Dance Theatre’s double bill, set to the powerful music of Igor Stravinsky, is contemporary dance with a vengeance. There is little or no acknowlegement paid to earlier balletic arrangements in the choreography. That is, perhaps, how it should be. What is lacking, however, in Michael Keegan- Dolan’s version, is clarity of context and relevance to the music. Despite the programme notes, some members of the audience were left floundering. On the male side, there are striking elements, such as the wide-legged jumps done in unison while balancing cardboard boxes, cartwheels, somersaults, rhythmic stamping et al – some sequences are threatening and violent. This is not for the squeamish. Petrushka, in the second half provides some light relief after the difficult first half. Petrushka was composed in 1911, and balletomanes will be familiar with the traditional ballet, which tells of a traditional Russian puppet, Petrushka, made of straw and sawdust, who comes to life. Again, Keegan-Dolan’s take brooks no quarter, paying no homage to the original apart from covering the dancers’ faces in dense white make- up like puppets. The cast displays wonderful fluidity of movement in this half, which is altogether more accessible, although there are still some shocks. Despite the power of the dance, the strength and sheer volume of Stravinsky’s score tends at times to overwhelm the dancers, which is perhaps not surprising, given that it was conceived originally as a concert work. It was that great dancer Diaghilev who, back in 1910, persuaded him otherwise, resulting in the performances that caused much outraged comment back in the early 20th century. Despite the clever concept which it undoubtedly is, the same might be said of Keegan-Dolan’s version.